It’s important for a critic to understand and to state their bias, so I should say upfront that I love the original 1977 version of Suspiria. Dario Argento’s hallucinatory masterpiece is one of the most beautiful horror films ever made, and to my mind one of the greatest. This only became clearer with last year’s stunning 4K restoration and Blu Ray release, which made the extraordinary colours leap off the screen like never before. Given my love for the film, the idea of remaking it never made sense to me. Suspiria is a true original, and a pure auteur piece, how could any filmmaker hope to either replicate or better it? To his credit, director Luca Guadagnino seldom tries to simply copy Dario Argento’s film or his style more generally. This is a markedly different film to the original, in look, in mood and in emphasis. Remake doesn’t seem an entirely fair label, this isn’t one in the way that, for instance, the recent Cabin Fever remake was. Sadly, this doesn’t help the film’s case much. The setup is broadly the same. Susie Bannion (Dakota Johnson) comes to Berlin to study at the dance academy run by Madame Blanc (Tilda Swinton). Girls have gone missing, and there are whispers that the company hides a coven of witches. The story is also expanded in this version, with a new strand involving Josef Klemperer (Swinton under a lot of prosthetics), a psychologist who treated Patricia (Chloe Grace Moretz) before she ran away from the school, investigating the disappearances. While Guadagnino’s willingness to treat the original film as a jumping off point rather than a template is admirable few, if any, of his changes work. First and foremost among these is the colour palette, which is the most extraordinary aspect of Argento’s film; it’s bold, lurid, otherworldly and gorgeous. From the second that film’s Susie (Jessica Harper, who has a brief cameo here) steps off the plane that brings her to Berlin she slips into this surreal world soaked in colour. Guadagnino’s film couldn’t be more different in this respect, it’s deliberately stripped of primary colours, with a wintry look that tends to grey much of the time. In the biggest crime of this version, much of it is very dull to look at, drab not just in comparison to Argento’s film but often in its own right. In adapting and expanding the original, Guadagnino and screenwriter David Kajganich have added almost an hour to the running time. The result is a bloated and often lumbering film that feels even longer than the 152 minutes (in six acts and an epilogue) it actually runs. It could be argued that Argento’s film could do with some expansion, after all, he was never known for the depth of his characterisation and Suspiria’s characters are more pawns in his world than fully realised individuals. Unfortunately – a brief and cliche look into Susie’s religious childhood apart – this isn’t where the extra time is used. Instead almost all of this time is spent on Klemperer, whose role could be almost completely cut out and nothing lost. The scenes with Klemperer try to tie the film’s backstory into the holocaust, but this ends up feeling cheap, because it never has any impact. The same is true of Swinton’s stunt casting; she’s good, but there’s no reason for this role to be played by her. This might have been a fascinating new aspect of the film had there been ties between Madame Blanc and Klemperer, then having Swinton play both parts would at least have had some thematic richness to it. The acting in the original Suspiria is impacted by the use of dubbing, but it could also be argued that the sometimes over the top work is warranted by the film’s baroque tone. 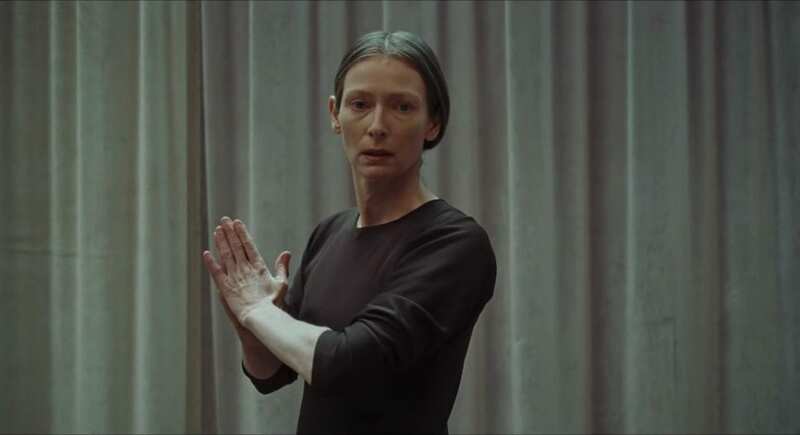 Tilda Swinton is one of the greats, not so much an actor as some kind of alien being who has come to grace cinema with her strange and wonderful presence. Her Madame Blanc is maybe the only thing that consistently works here, It’s no stretch to believe that she’s secretly a witch. For the most part Dakota Johnson is fine, her physicality works for the dance scenes and she delivers what the script asks of her, but there’s not much for her to grab on to. It never feels like we get to know Susie, the addition of backstory is all well and good, but it doesn’t seem to mean anything. Then comes the end of the film. Let’s just say that a key line of dialogue doesn’t convince in any way, either at script or acting levels. Potentially more interesting is Mia Goth as Sara, her investigation of Patricia’s disappearance is one of the film’s stronger threads, until it just sort of peters out. It is, however, telling that Goth’s best performance to date came in The Survivalist, in which she barely spoke, and she remains a rather inexpressive actress when it comes to dialogue. The cast is filled out by a litany of female luminaries of European cinema. Angela Winkler, Ingrid Caven, Sylvie Testud, and Renée Soutendijk are all welcome and too little seen presences, but none of them has much to do and like so much else, their presence becomes a wasted opportunity. The earliest moment in which this Suspiria threatens to come to life and take us down a truly interesting alternative path is in the first death scene. After another dancer becomes convinced that the company is actually a coven she too runs away, but she ends up trapped in a room with entirely mirrored walls. Susie volunteers to take her part (the lead) in the piece being prepared. As Susie rehearses, the other girl violently mirrors her moves, dislocating bones and twisting herself into a deformed, but still conscious, pile of flesh. It’s the only truly scary sequence in the film, and the only one that comes close to the apparent goal of replicating the impact of Argento’s work without stealing his moves. The other great moment is the visually startling dance performance itself, with the performers dressed in red ropes. Cross cut with another atmospheric scene, set in the tunnels under the school, it’s another glimpse of what this film might have been. While the otherworldliness of the 1977 film takes you immediately, the fact that this film is set very much in the real world means that it just doesn’t work in the same way. This is felt most acutely when Guadagnino tries to stick most closely to Argento’s template, for instance, the sequence of tracing footsteps the girls have heard the staff making is built up in the original film, but here it seems to arise almost within an instant. Again, this might work if it felt magical, like a victim being drawn in, but instead it’s the one thing that is simply a direct photocopy and it’s just adrift in the film. Guadagnino makes constant reference to the Baader Meinhof gang and to the holocaust, but neither makes any impact on the story and the grounding of the school in the real world means the last act shift fully into the supernatural is a grinding gear shift. At the very least, this is a far more ambitious undertaking than your average horror remake and it’s easy to see why it has proven divisive. While I fall on the side of disliking it, that’s not because I can’t see what people have found in it. Stylistically, it simply doesn’t work for me, and that only compounds the issue of its painful overlength and straw clutching reach for political meaning. If those things come together for you, then I can see why this might be one of the better horror remakes. For me it’s an ambitious swing, but a wide miss. Sam Inglis has been writing about movies for 20 years. His interests include coming of age movies, horror and exploitation cinema and literally anything featuring Jennifer Jason Leigh. He tweets at @24FPSUK, and blogs at 24fps.org.uk. He also thinks writing about himself in the third person is weird.